> Yesterday, the Brewer Nation reported that the Mariners are interested in Mat Gamel. I don’t know why anyone else (or me) thought of this possibility earlier, but it makes perfect sense. 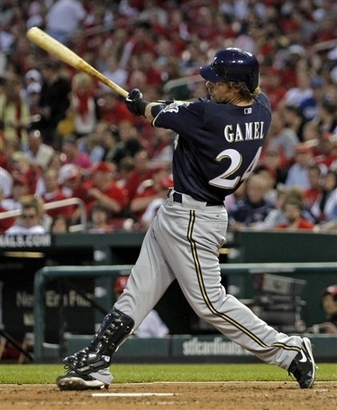 If Gamel does return to the Brewers next year, he’d be playing a bench player/utility man-type role. Gamel was basically handed the starting job at first base in 2012 following the departure of Prince Fielder, but the opportunity was snatched from him early in the season. While trying to catch a foul pop-up in San Diego, he lost track of where he was, and his knee met with the wall. As it usually works, the wall won, and next thing you know, the Brewers’ starting first baseman is gone for the season. Thankfully, Corey Hart swooped in from right field and took over at first base- a position he hadn’t played since Class A, which was nearly a decade ago- and was stellar defensively. And, since his offense was already better than Gamel’s, there wasn’t much thought put into who should start at first base in 2013. Gamel can also play third base (though not very well) and the corner outfield spots, but he’s blocked by Aramis Ramirez, Ryan Braun, and Norichika Aoki at the respective positions. That would leave him as a bench player, and history tells us he wouldn’t have much success in that role. Gamel has proven that he needs consistent playing time in order to produce, and it appears the Brewers aren’t going to be able to give Gamel that playing time. This is where Jack Zduriencik and the Mariners enter the equation. Zduriencik, who was a scouting director for the Brewers at the time Gamel was drafted (he also played a huge part in drafting Fielder), knows Gamel well, so there’s some familiarity there. The Mariners, as we all know, are also in desperate need of offense in any way they can get it, particularly at first base, third base, and the corner outfield positions. First baseman Justin Smoak hasn’t given the Mariners the power numbers they thought he was capable of producing. The M’s just released third baseman Chone Figgins. The Mariners’ outfield has been a revolving door the past few years. All of those factors prove even more as to why this move could benefit the Mariners as a low-risk, high-reward transaction. But enough of how it would help the Mariners- it could help the Brewers in a lot of ways, too. The Mariners make up for what they don’t have in offense with their wealth of young pitching; keep in mind this team produced Felix Hernandez, one of the best pitchers in the game. Anyway, the Mariners probably wouldn’t be willing to part with an ultra-prospect like Danny Hultzen or James Paxton, but they still have more than enough pitching depth behind those two. Perhaps the Brewers could get a guy like Blake Beavan in return for Gamel. The point is this has the potential to be one of the rare deals that truly benefits both sides. It could also be of huge benefit to Gamel; I think he just needs a fresh start somewhere else. > Also via Brewer Nation, Josh Hamilton’s agent has reached out to Doug Melvin. This probably doesn’t mean much; it’s probably just the agent saying, “My client would consider playing here” (as stated in the article). It’s doubtful that Hamilton-Brewers talks will advance anywhere beyond this, but it’s certainly worth keeping an eye on. 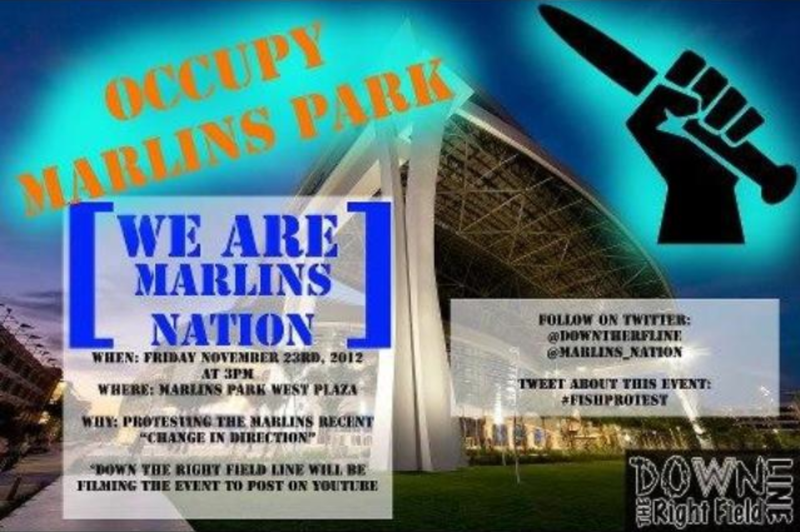 Keep in mind this the Marlins’ only star player left. 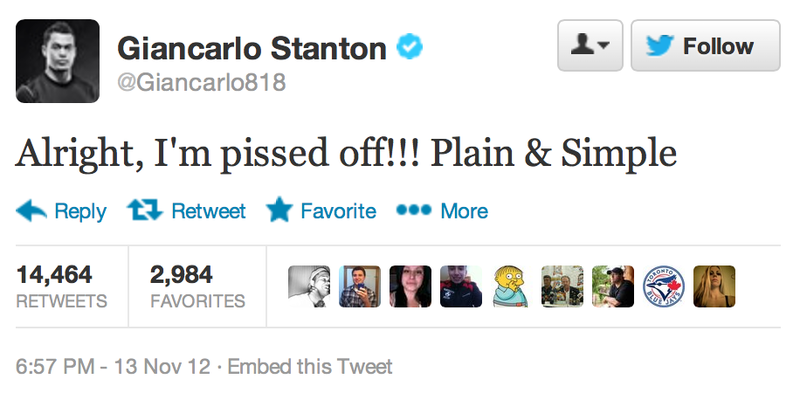 Anyway, Buehrle was apparently told “verbally” that he wouldn’t be traded. But the Marlins don’t give out no-trade clauses (probably because they like having the ability to dismantle their team at any given time, as history has told us), at least officially. So Buehrle does have a legitimate beef, but, to be fair to the Marlins, it was never legally official, giving them every right to trade him. Though I still think not giving out no-trade clauses is a stupid concept. > It was reported two days ago that the Blue Jays signed Cesar Izturis to a minor league deal. But, today, we found it was actually Julio Izturis, not Cesar. So whoever originally reported this needs to get their Hispanic names straight. The Jays also signed Maicer Izturis, Cesar’s half-brother, to a three-year deal earlier this offseason. All three of these guys are related. > I found this on Twitter a few days ago. Whether or not it’s legitimate, this is hilarious.